The old oak reaching out in the mist. One of the gifts I got for Christmas (or maybe it would be more appropriate to say one of the gifts I gave myself) just kicked in, so to speak, last week. It’s an intensive (and intense) 11-week yoga course called The Art of Self-Care. I’m not going to provide a description of what the course is (you can read about it here, if you’re interested), but I will tell you that it isn’t what you might think. It isn’t about a brand new diet or a 30-day challenge or even New Year’s resolutions. It is, as I’ve already discovered in just the first week, so much deeper than any of that. Some of the many arms of an old cedar tree. Remember the word I was avoiding when I picked my word/theme for the year? Yeah, that: Surrender. It’s a good word. I avoided it because I wasn’t sure I was ready for the lessons it might teach. I went with Listening (or Listen) without realizing how deep listening, truly listening to either yourself or others or the world around you, is also a type of surrender. When I figured that out last week, I had to laugh. And laugh some more. The Universe has an amazing sense of humor. What you resist, persists. Or so they say. They may be right. I have not worked with any kind of formal teacher in a very long time. Decades. I have never worked with a yoga teacher. Almost all of my learning about yoga, of yoga, has been as a solitary practitioner via books and Yoga Journal magazine (back in the old days, when I was a dinosaur), and later via videos, blogs, and newsletters I have taken one yoga class, way back in the 90’s. I left the class feeling as if I somehow failed and I must have carried that feeling with me because it is one of the reasons I’ve avoided another class. It is also something, or a ghost of something, that I feel now, working with a teacher. A touch of inadequacy. Diving into that further, it’s not so much a feeling of inadequacy or lack of worth as this: I am WAY outside of my comfort zone. Way, way, way out. 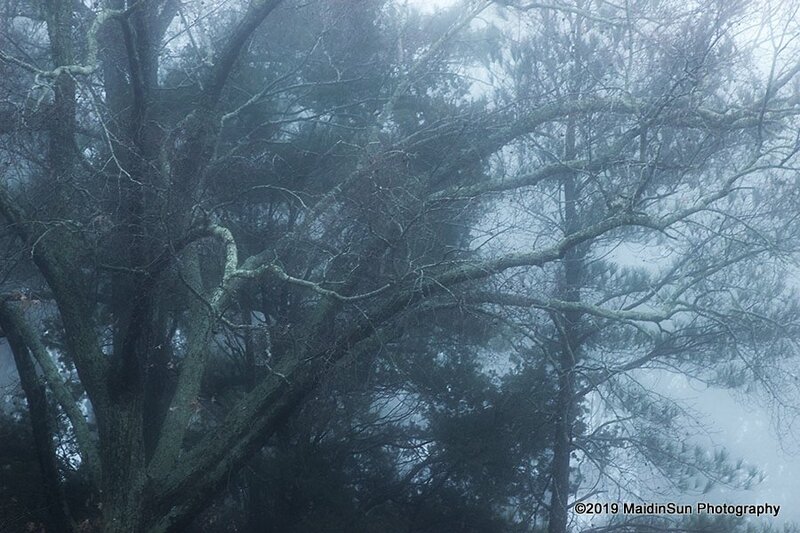 I love the way fog softens the landscape. 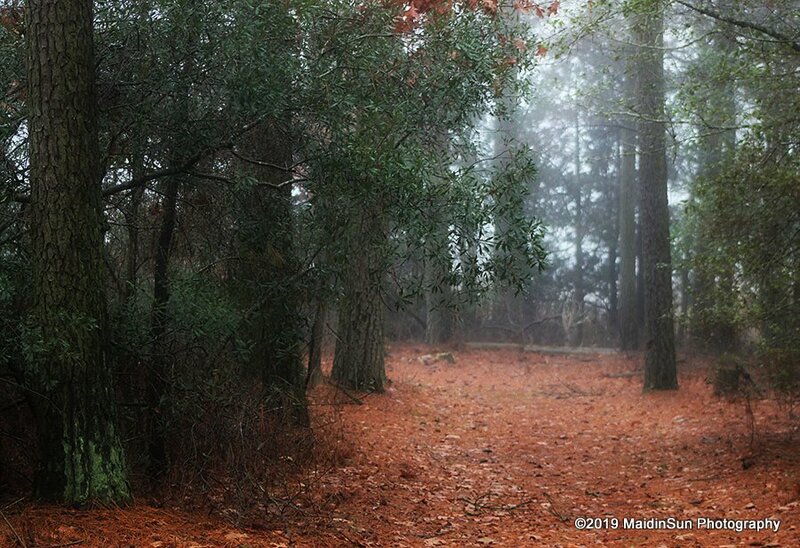 Sometimes the fog makes its way into the woods. This was one of those mornings. … hate for hate only intensifies the existence of hate and evil in the universe. If I hit you and you hit me and I hit you back and you hit me back and go on, you see, that goes on ad infinitum. It just never ends. Somewhere somebody must have a little sense, and that’s the strong person. The strong person is the person who can cut off the chain of hate, the chain of evil. And that is the tragedy of hate, that it doesn’t cut it off. It only intensifies the existence of hate and evil in the universe. Somebody must have religion enough and morality enough to cut it off and inject within the very structure of the universe that strong and powerful element of love. I don’t know that I have “morality enough” but it’s something I want to dive into. I’ve grown tired of the hate, and it’s something I hoped we would be long past by now. If only those who profess to be followers of certain religions practiced what was preached. It might make this a better world. I reckon that’s enough of that. I apologize if it sounds as though I’m preaching. It’s not my intent. I’m just working through things I’m learning in a way that I haven’t learned them before. That’s also enough meandering on this cloudy Monday. We started out the day with a beautiful sunrise, but the day gradually grew cloudier and cloudier. It was nice to see the sun for a little while. I don’t think we’ve seen much of it during this first week of 2019 (or the last week of 2018). It’s been showing up in the early mornings and at sunset, from time to time. Sunset tonight is 5 PM. On the dot. Let’s meet on the dock if it looks like the clouds will clear. I’ll be there about twenty minutes before that. I will probably ramble a little in the woods first. Bundle up. It’s damp and chilly (in the 30’s), and that kind of weather seems to cut right to the bone. 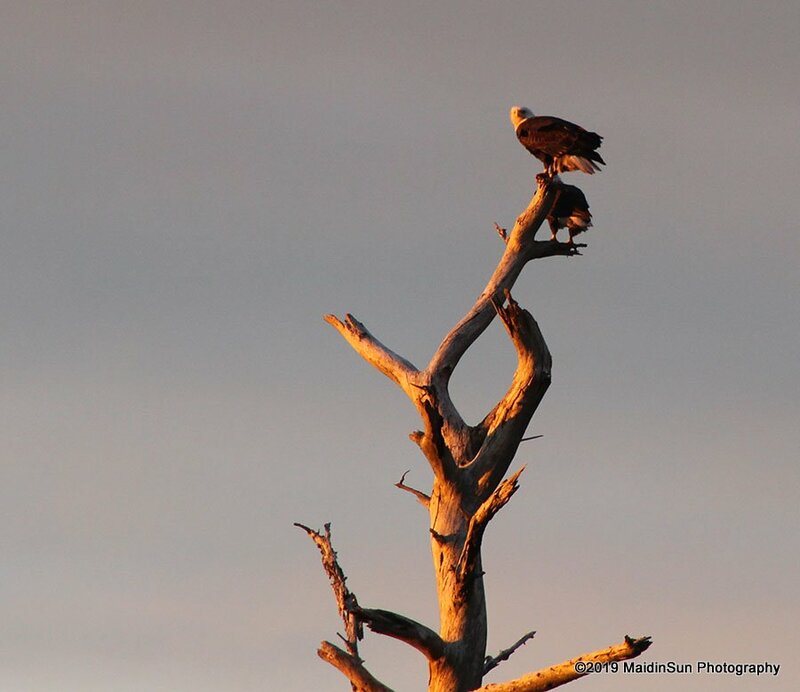 A pair of Bald Eagles perched on the Eagle Tree out at the Point. It was very cold and very windy that day. This was the best I could do with the lens that I have. Sometimes I wish I had one of those monster zoom lenses. A few of the 10,000 reasons to be happy: 1,001) New (to me) ways of learning. 1,002) Watching the tide come in and go out, and that moment when it seems to stop before changing directions. 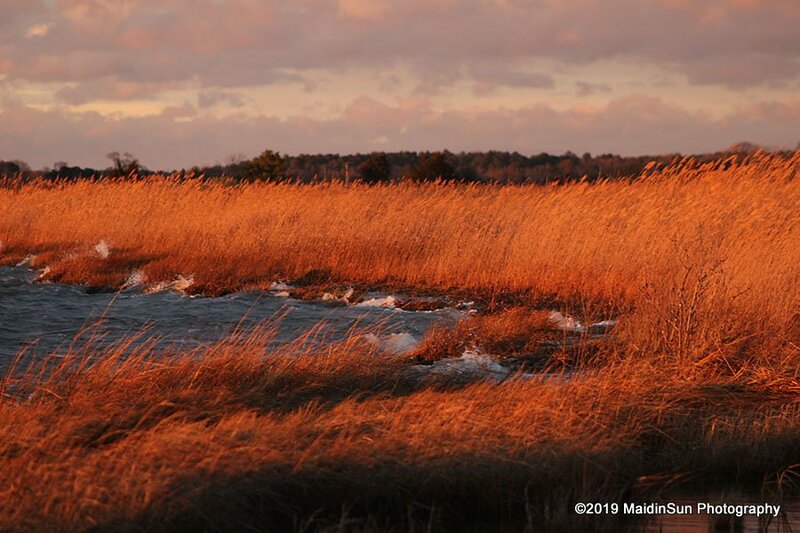 1,003) The pair of Bald Eagles living somewhere near the Point. They must be getting used to me. They used to fly off as soon as I stepped out of the car. They don’t do that anymore. 1,004) Being able to read a bedtime to story to Little Wookie last night thanks to the marvels of modern technology. 1,005) Late Christmas packages. A couple of them arrived today, giving us a chance to celebrate all over again. 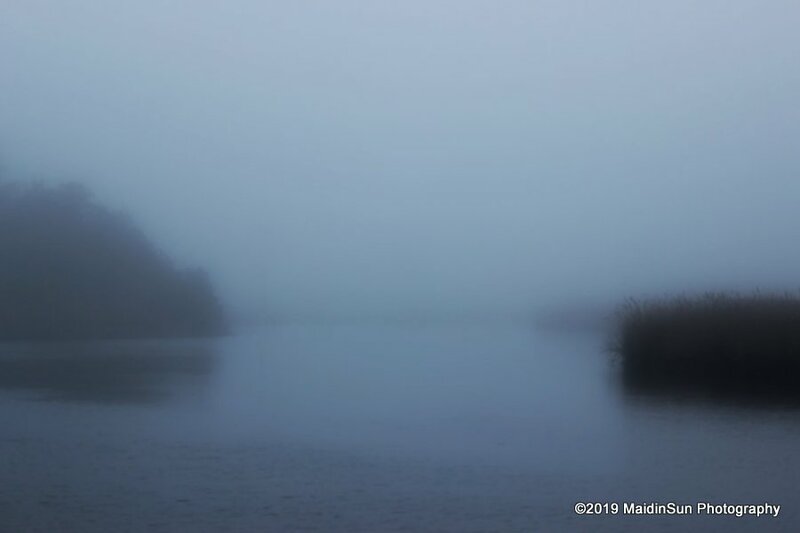 I love the mood in your pictures, mist, mystery and tranquillity!! I’ll be contemplating your deeper thoughts a bit more, but I can say I haven’t seen the sun much either. I’m starting to miss it! Of course, they said far away suburbs would have a snowy mix around midnight. What’s happening near me now, nowhere near those suburbs and at 4:45? Sleet and snow. HOW can they be SO WRONG so often?!?! 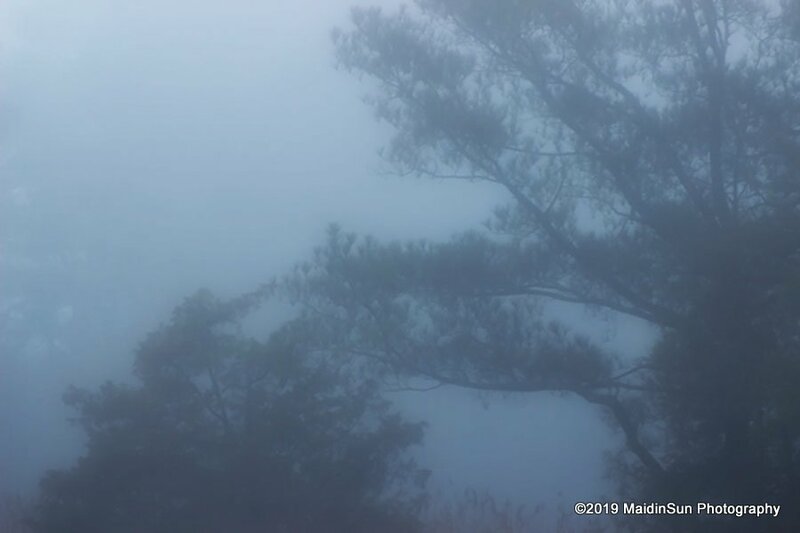 The fog so beautifully shown in your photos seemed to envelop me, and I could feel the chill to my bones, which made your last photo of early morning or evening sun warming the rushes even more welcome. Beautiful photos. I wish you well on your yoga adventure. 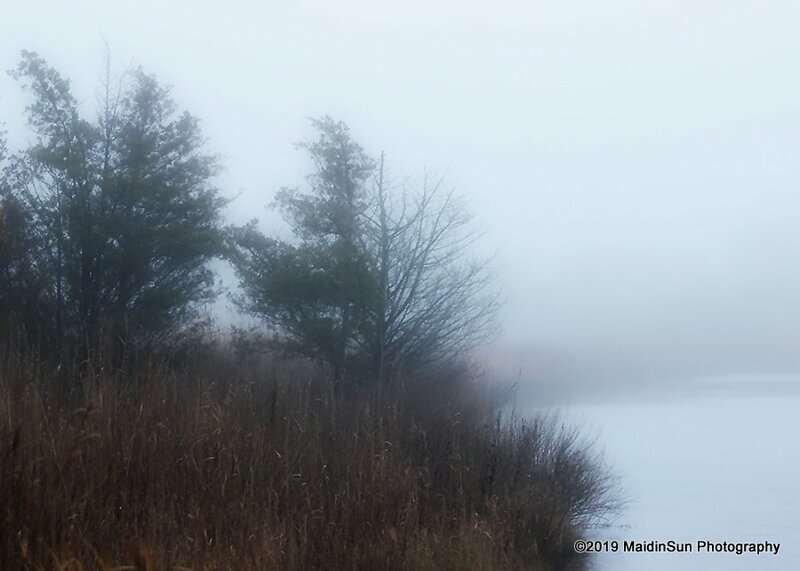 For me, foggy scenes stimulate reflection. Enjoy the yoga! As for surrendering to listening… I think that is huge. And good for you for choosing to. An adventure into listening and surrender – excellent Robin. 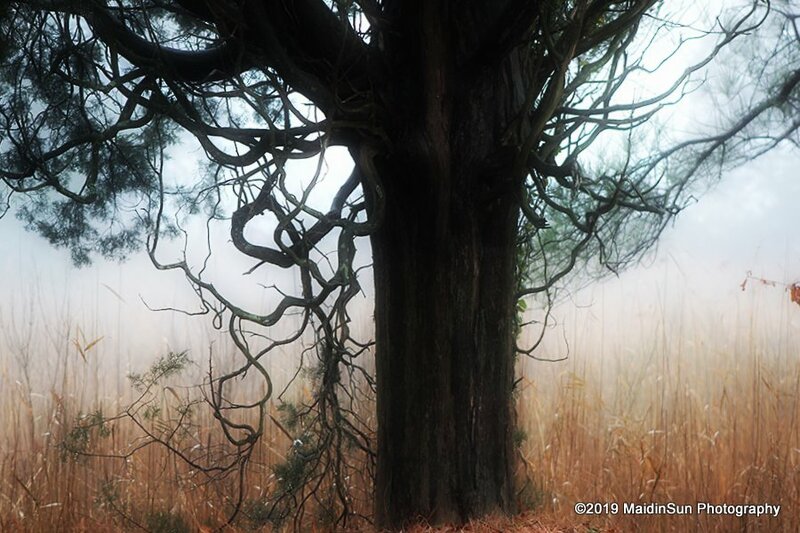 The gorgeous photo of Cedar in the Mist personifies that – by standing still we go higher and deeper. All the best for 2019 and your becoming a pupil again – (I believe pride comes into this resistance somewhere – speaking for myself!) And I approach yoga as body awareness – feeling the limitations and extending boundaries, getting acquainted with places of stiffness and numbness. Sometimes it is good to have a guide through that. 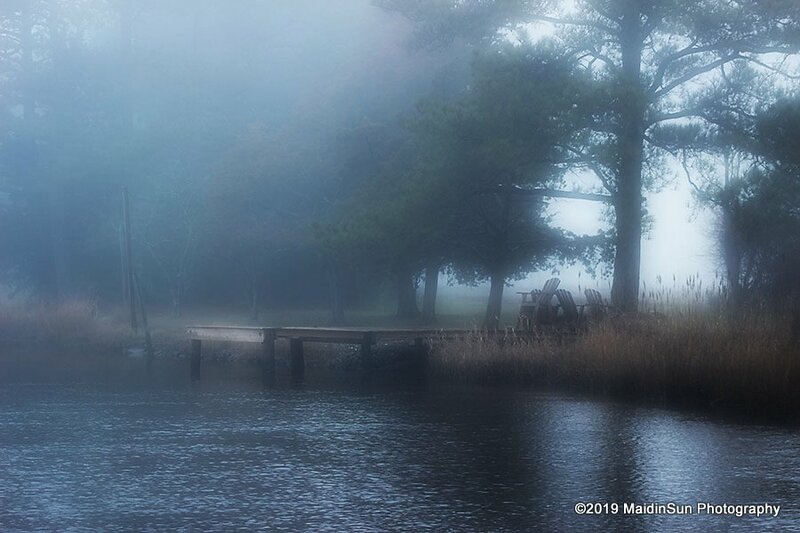 Beautiful misty photos–but eventually the fog gives way (we hope). I’m glad you are enjoying your learning process. I guess that is a type of surrendering, too. 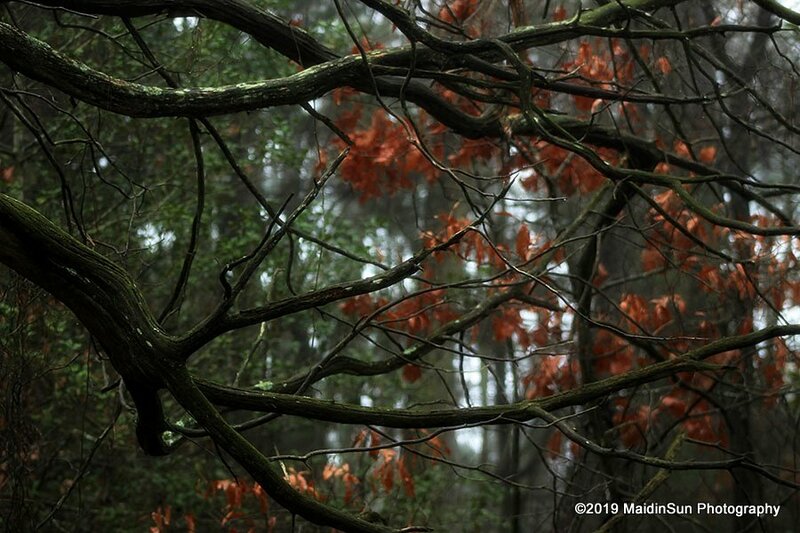 We also saw the sun all too briefly yesterday, but then got some sleet and rain. That pair of eagles–wow! Meandering! It takes so much longer to get anywhere, but you see so much more along the way. I think “listening” is good. Thanks for the thoughts friend. Your images are excellent! The posting was a joy to read. Beautiful images and well done to you for moving outside your comfort zone, I hope your journey is a fruitful one.